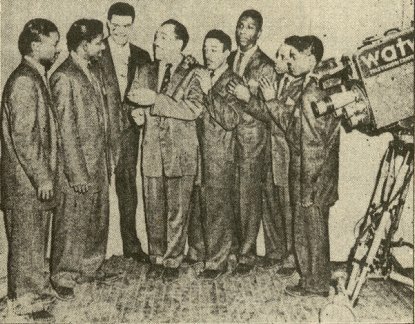 Above: Cashbox (2/20/54) photo of William Cook (4th from left) with The Harptones and Roy Hamilton (3rd from left). Cook was an R&B disk jockey at WAAT in Newark, NJ. He also owned a night spot in Newark called Cookie's Caravan and hosted a TV show on WATV named "Cook's Caravan". Above: Label image for Savoy 828-A recorded on 11/28/51 and released in December 1951. William Cook performs the narration and Maithe Marshall does the tenor singing on this one. 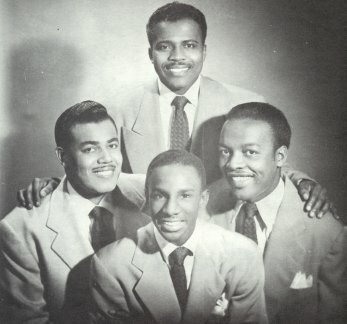 The Marshall Brothers also had two releases on Savoy (1951-52) without Cook. 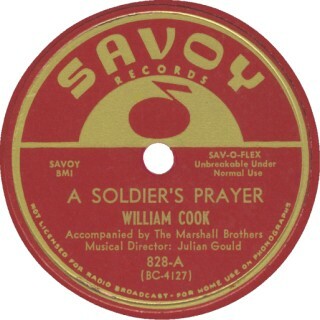 Click on an option below to listen to "A Soldier's Prayer" by William Cook And The Marshall Brothers using RealPlayer.